Samir falls in love with Agathe, a swimming-instructor. To seduce her he pretends he doesn't know how to swim so she can teach him. 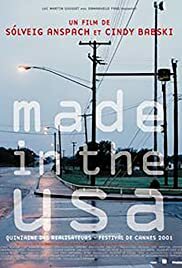 "Made in the USA" is a documentary about the execution of a black youth who always claimed his innocence but was unable to afford expensive lawyers. The film alternates interviews of friends and family of the condemned and lawyers on both sides, with views of the jail on the day of the execution and still pictures of slums with a voice off reading statements of the condemned; they show dilapidated houses and slums filmed with such light and colors that they make beautiful pictures. The film does not draw any conclusion as to whether O. Barnes was guilty or not. It does question whether somebody who is black and poor gets a fair trial and is executed only when proven guilty beyond any reasonable doubt.